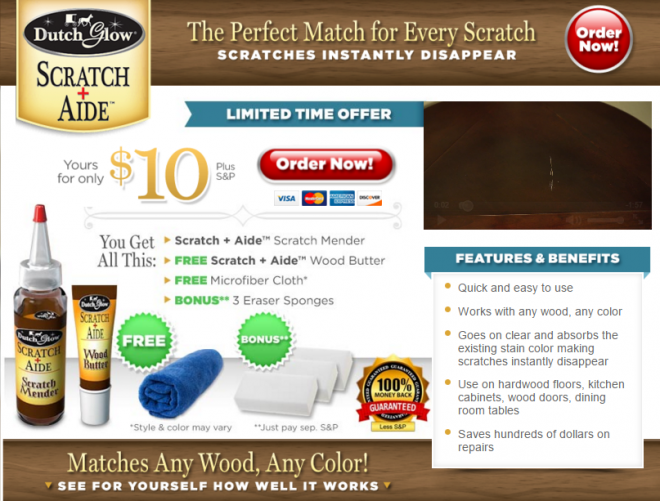 Scratch Aide is a wood scratch mender. Scratch Aide is a filler which can conceal any scratch on any kind of wood. The product website is scratchaide.com, which was registered in September 2014. The screen capture below shows the official website in October 2015. Another domain used for advertising is scratchaidesale.com. Scratch Aide is brought to you by the makers of Dutch Glow wood cleaner, which hit the airwaves heavily in early 2014. Now with Scratch Aide we are promised a quick and impressive wood repair product. The claims in the advertising for Scratch Aide are rather lofty, showing nasty wood scratches virtually disappear almost instantaneously. But does it work? As with most As Seen on TV adverts, the claims aren’t always realized by real-world consumer tests. While Scratch Aide is one of many wood scratch repair products on the market, consumers should be realistic in their expectations. And, while some of those competing products are relatively high rated, Scratch Aide only manages to garner a 2-star rating on Amazon. We found that Scratch Aide does work on certain types of scratches, particularly those that aren’t too wide or deep. In the cases of mild scratches, you apply the clear liquid, then a day later apply the white liquid, and scratches will improve in appearance. Some woods did not seem to benefit as well as others (darker seemed to handle it best). Some consumers on Amazon have stated that it actually made scratches worse, so you may want to use with caution. Let us know what you think of Scratch Aide by leaving a comment below and a star rating above. Ultra HD Clear Vision Review: Does it Work?